A new working paper on ‘catch-up’ growth explores whether interventions outside of the first 1,000 days can improve developmental markers in young people. (23 July 2018) Undernutrition has made stunted growth and the delayed onset of puberty common in many regions. However, stunting recovery interventions may enable undernourished young people to catch-up on height and other developmental markers. The potential for a ‘catch-up’ growth window in adolescence has been suggested for some time but has not yet been substantiated. 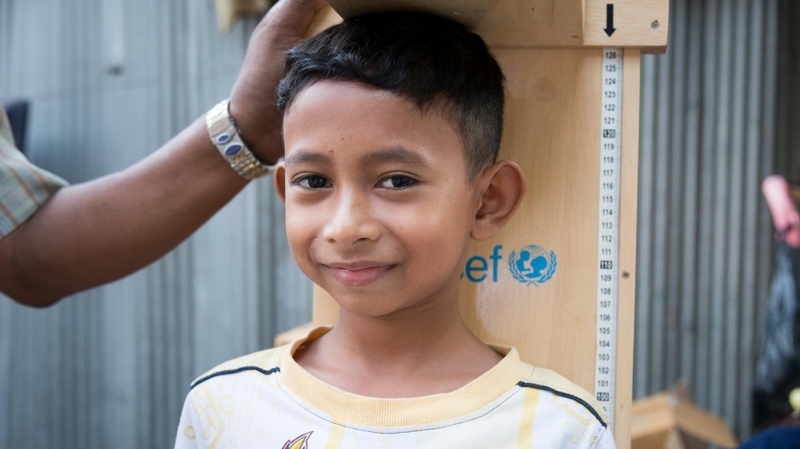 A new working paper published by UNICEF Innocenti, The Intricate Relationship between Chronic Undernutrition, Impaired Linear Growth and Delayed Puberty, explores this important opportunity. Adolescent girls react during a nutrition counselling session at the anganwadi center in Maharashtra, India. Chronic undernutrition is characterized by long-term exposure to food of insufficient quality and inadequate quantity. In a state of chronic food insufficiency, the human body conserves energy by prioritizing essential metabolic processes resulting in impaired growth and delayed reproductive maturation. As the human capital of the future, drivers of economic growth, and parents of the next generation, adolescents are an incredibly important group. Therefore, addressing undernutrition in young adolescents is critical. With 15–20% of total height and 45% of adult bone mass achieved during adolescence, this phase may be the final opportunity to influence adult height and mitigate stunting. Growth and development during adolescence are susceptible to nutritional, environmental and hormonal factors and, subsequently, possible modifications. With 15–20% of total height and 45% of adult bone mass achieved during adolescence, this phase may be the final opportunity to influence adult height and mitigate stunting. Knowledge gaps, including adolescent-specific evidence and the long-term effects of undernourishment, inhibit progress in this area. To address this gap, UNICEF Innocenti conducted a workshop bringing together humanitarian and adolescence experts from around the globe. This working paper serves a summary of the biological-centered discussion that took place in the workshop, and outlines knowledge gaps and opportunities. The paper provides a review of key literature on catch-up growth during adolescence, including: catch-up growth from longitudinal cohorts in LMICs; catch-up growth of children born small-for-gestational age; and catch-up growth through a change in environment. Biological mechanisms - including puberty onset, the hormonal consequences of undernutrition, and bone growth – are also considered. A boy has his height and weight measured in South Phnom Penh, Cambodia. The study finds an association between undernutrition, impaired linear growth and delayed puberty. It also acknowledges that puberty is the period in which catch-up growth may (or may not) take place. However, these findings are limited due to uncertainties about the biological mechanisms of growth and adolescent-specific influences on linear growth. Difficulties in determining catch-up growth during adolescence arise from incomplete data on the subject. Despite the available evidence on catch-up growth in adolescence, there is still a lack of high-quality data, particularly for adolescent boys. Methodological inconsistencies in definitions and reference populations make comparison between studies difficult. The practicality of collecting individual-specific puberty and growth measures, for example breast development or long bone fusion, further compounds the issue of incomplete data. Without a global standard to identify catch-up growth in adolescence, mainstreaming results remains a challenge. The paper calls for increased collaboration among stakeholders and consensus on research methods in order to strengthen existing findings. Without more robust evidence, interventions aimed at ameliorating stunting will be compromised. This working paper is one of various pieces of research being conducted on the long-term effects of humanitarian crises including the analysis of genocides in Cambodia and Rwanda on well-being of adolescents and a piece on the knowledge gaps and possible solutions to measure long term effects of crises. This series will also include a final piece on data collection improvements required to capture the long-term effects of undernutrition and to identify more specifically the vulnerabilities of adolescents.